Construction instructions, pictures and videos are available here. Hardware Rev F and previous designs are available for download from SourceForge . Support for SD an MMC cards in this version. Some of this imformation may not relate to the latest release. I working to try and bring this up to date with the next release of hardware. 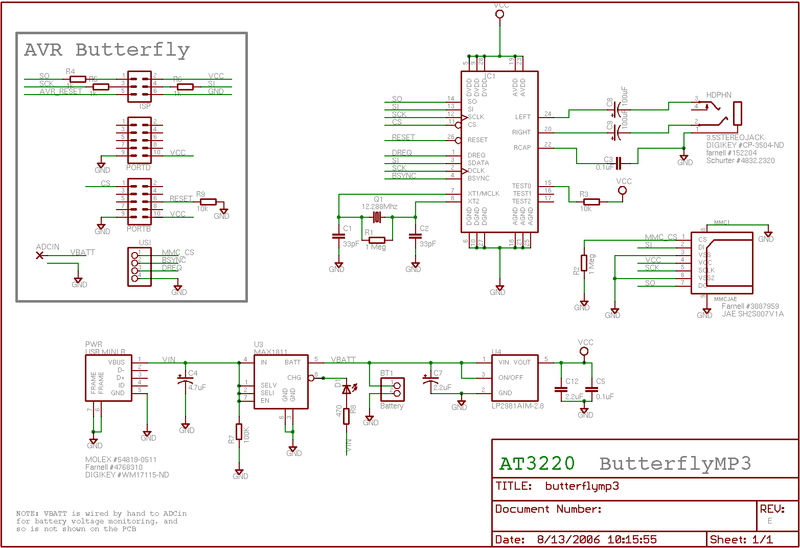 The schematics and related info for the AVR Butterfly can be found here. 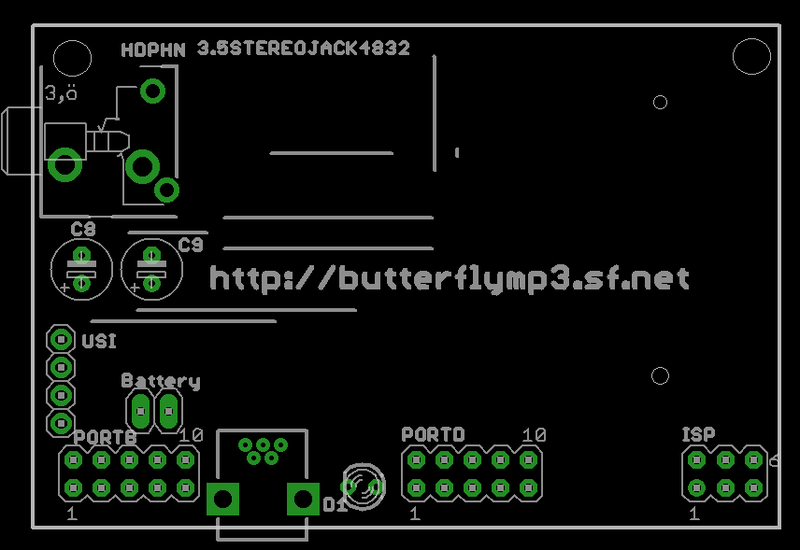 You can download schematics for the Rev F add on board containing the MP3 decoder chip here in PDF format. 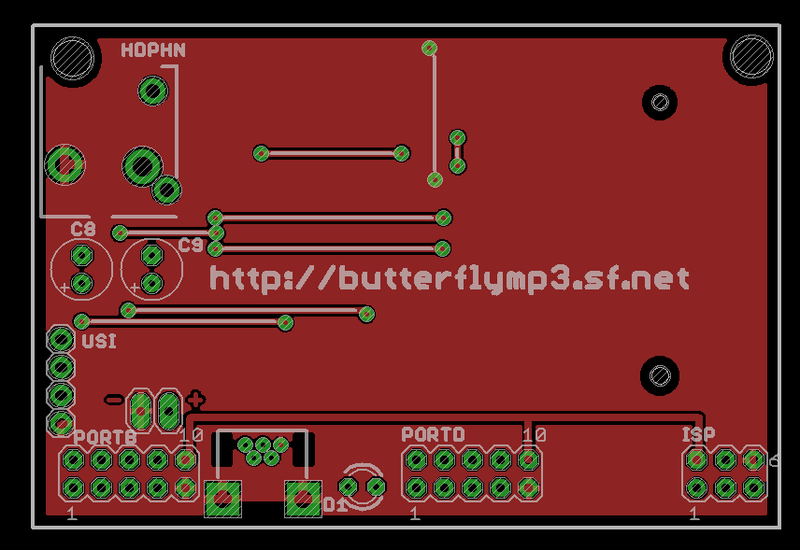 The grey box on the left of the diagram represents all the ports connections available to the PCB from the butterfly. The current Rev F schematic. 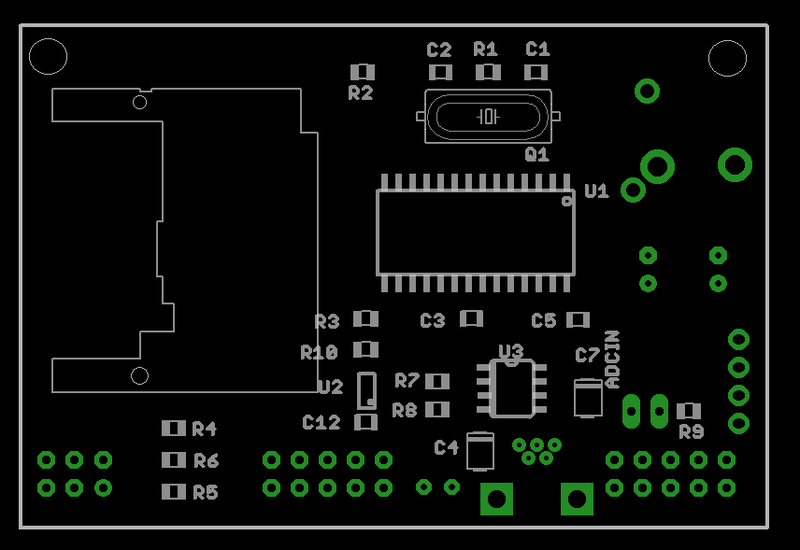 The PDF version of the PCB can be dowloaded here. The location of butterfly port connections shouldn't be moved as they are positioned to fit (almost) exactly onto the bottom of the butterfly. "Port D" was not really required for electrical reasons, but was included to add physical stregnth to the device as these connectors are the only support for the board (at least in the prototype). Top view of PCB copper and silkscreen. Bottom view of PCB copper and silkscreen. So you want to help? You just want to build this damn thing? Here's roughly what you'll need. Custom PCB or some method of connecting chip to buterfly to MMC. The following is the up to date bill of materials for the latest version of the PCB. The parts are available from Farnell and digikey with the exception of a few items. If you cannot see the list below then it is also available here. And where can I get those parts? And how can I build it? 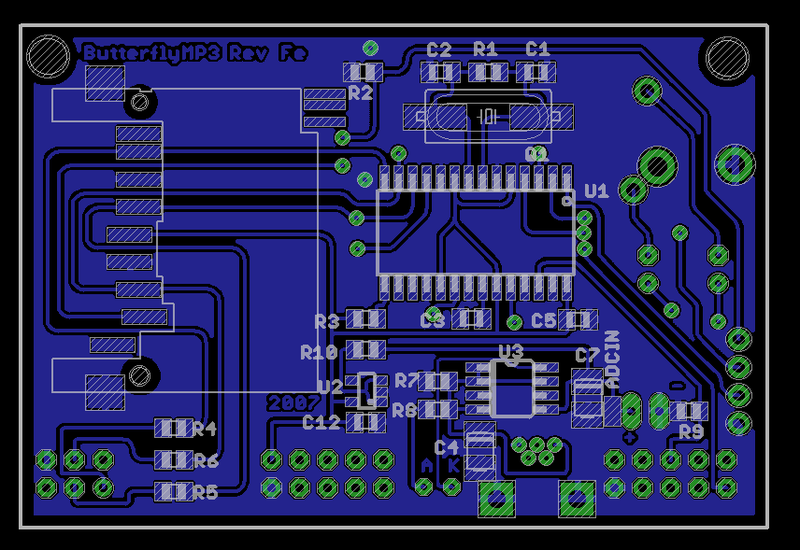 The Rev_B design now includes a low drop out 3V regulator so power source is not really an issue, but if using 3V (2 x AA cells) then you can just replace the regulator on the PCB with a jumper from vin to vout. The Rev_C deisgn uses a MAX1811 to handle charging a LiION (4.2V) Battery from a USB port.The design should really regulate the battery to 3.3V, but doesn't yet. The Rev_D board now includes a switched capacitor regulator (Texus Instruments REG710-3.3) to maintain Vcc at 3.3V. Using an unmodified Rev_C board will work but the life time of the MMC will be reduced. The Rev_F board uses a MMC/SD card from farnell. It has been tested with a 1Gb SD card with FAT 16 file system.